Wouldn’t it be cool if you could maximize your event attending experiences? Concerts, sporting events, and festivals deliver a great time to all attendees. However, problems at events are always unavoidable. What do you do when you are at and unfamiliar arena and can’t find a rest room or a food stand? What about when you are at a race and don’t know what is going on around the next corner? Recently, a group of New Media Institute students at the University of Georgia were posed with the challenge of eliminating these problems surrounding events. The students decided to create an iPhone application that can be used to maximize the event attending experience in several ways. 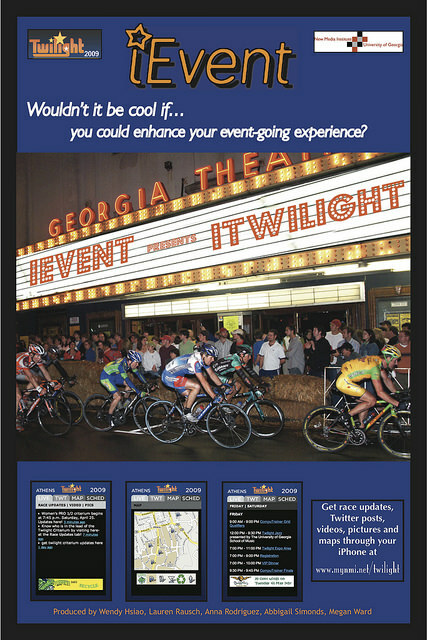 With the quickly approaching 2009 Athens Twilight Criterium, the students decided to use this popular Athens event as a basis for their mock-up product. 1. Create a successful application and working model surrounding Twilight. 2. Share this application with other event hosts to help them maximize their attendees experience. 3. Make a product that is so effective that event attendees expect to use it at all events.